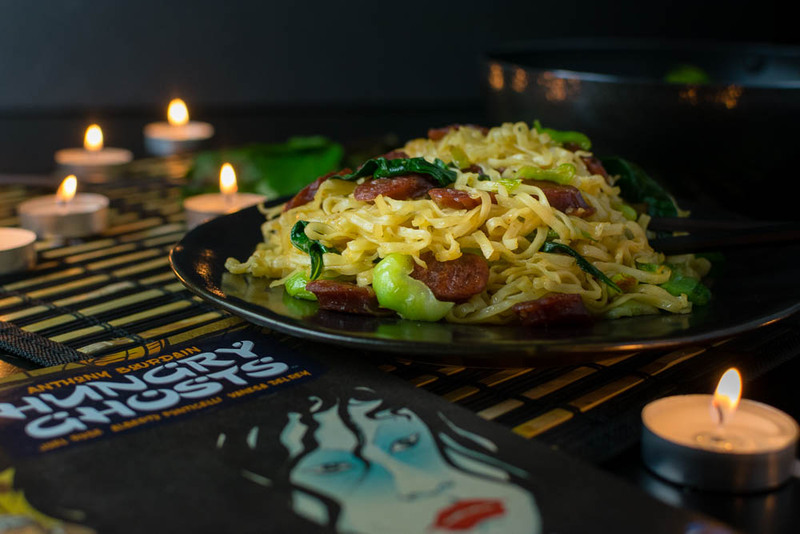 We received a review copy of Hungry Ghosts to help with creating our 100 Candle Noodles. You wouldn’t know it by how rarely we created recipes based on them, but we love comics. In fact, we have over 1300 single issues! Imagine how excited we were when Dark Horse asked us if we wanted to help promote Anthony Bourdain’s Hungry Ghosts comic! A food based horror comic? Yes, Please! Inspired by the game played in the comic, we are excited to share our recipe for 100 Candle Noodles! 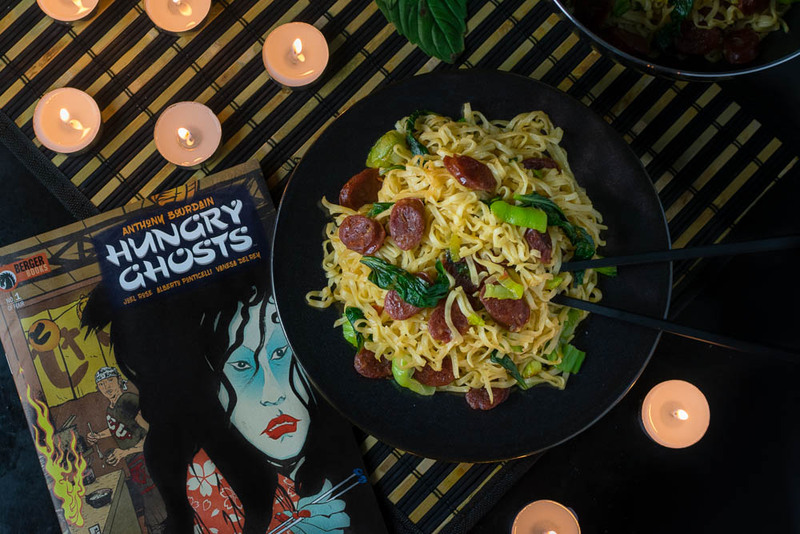 Inspired by the Japanese Edo period game of Hyakumonogatari Kaidankai, Hungry Ghosts reimagines the classic stories of yokai, yorei, and obake, all tainted with the common thread of food. The first issue finds a Russian Oligarch who dares a circle of international chefs to play the samurai game of 100 Candles—where each storyteller (a chef) tells a terrifying tale of ghosts, demons, and unspeakable beings. As we mentioned above, we are huge comic fans. Horror comics are really the bee’s knees for us. Hungry Ghosts reads like an anthology horror film. The stories within the comic are interesting enough to draw you in immediately but are short enough that it doesn’t feel tedious. We can’t wait to see what the next 3 issues hold in store! When creating our recipe for 100 Candle Noodles we took inspiration from the anthology style story telling. 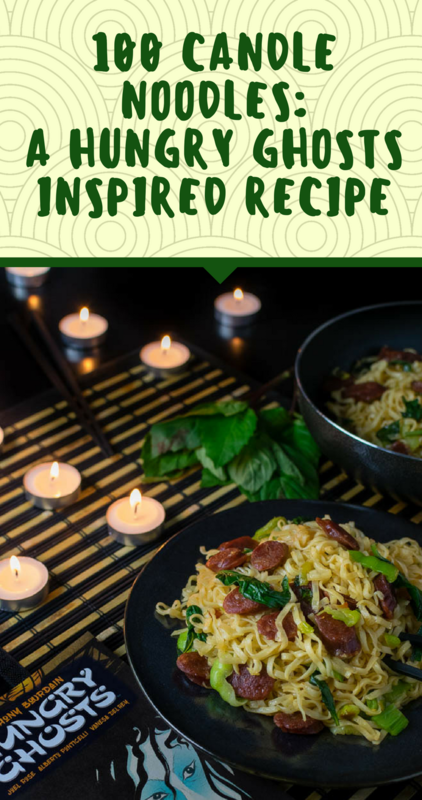 We selected various Asian inspired ingredients and combined them to create a sort of comfort food dish. This recipe is perfect for a night in reading horror comic books. Most of the ingredients will have to be purchased at your local international market but it will be worth the trip! If you haven’t tried Chinese sausage (Lap Cheong), you’re missing out! It provides a sweet note. In this recipe, it is balanced by the spicy sauce we’ve created and the aromatic Thai Basil. Comfort food at it’s finest! We hope you enjoy our 100 Candle Noodles! Be sure to check out Hungry Ghosts which makes its debut on January 31st! Be sure to let us know what you think and which short story was your favorite! Combine sauce ingredients in a small bowl. Boil noodles per package instructions. Over medium high heat cook sausage for about 5-7 minutes, or until sausage is almost fully cooked. Add bok choy and about 1 tbsp of water. Cover and cook for about 3-4 minutes, until bok choy starts to get tender. Cook until basil is wilted. Cook for 2 more minutes to allow flavors to combine. The Geeks were provided with a copy of Hungry Ghosts for research purposes. Images and title treatments were used with permission. All opinions are wholly our own. View our Disclosure Policy for more info. It sounds delicious! And now I am hungry for noodles.